It was hot, and all of us were reminded that yes, it is summer. By 9am it was about 80 degrees and the humidty was just below stifling levels. 45 guys in the cat 5 slugfest rolled out and began an incredibly unimpressive pace around the 5 mile course loop. Our race was 4 laps for a pithy 20 miles, hardly enough to time to separate the wheat from the chaff. Matt Buckleman, Brad Snyder, Tom Blanks and myself discussed this flattish course prior to Saturday and had determined with more or less certainty, that this would be a very boring race if we allowed it to be. 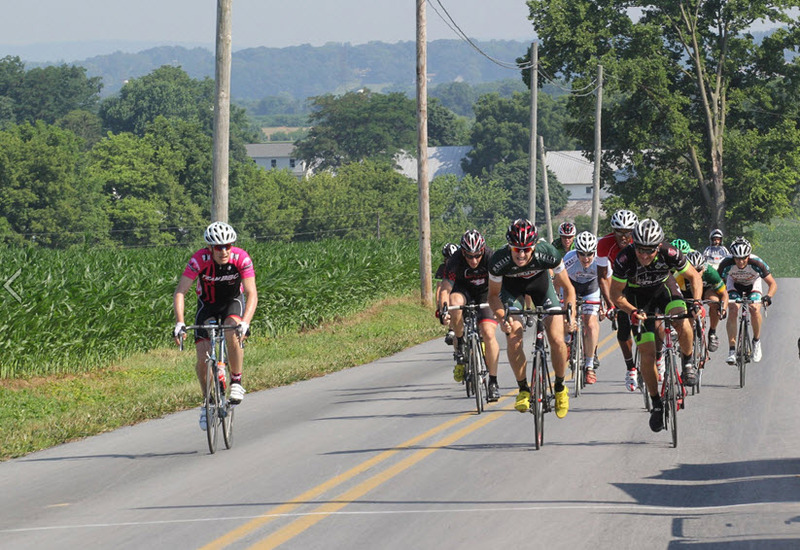 As a group, we pre-rode the course and found 2 potential places to start a breakaway effort. One hill about a mile from the finish line was probably 100m long and had a good pitch. Another smaller hill sat about 300m from the line. In our discussions, we collectively decided that the end of the second lap would do and thus the plan was set. Tom would lead the effort up the hill, I would follow and Matt and Brad behind me. Staying at the front can be a challenge in some races as there is a few things working against you; wind, other riders and your fatigue. However, we all managed to stay in the top 15 for the first two laps around. As we got near the "go" point, Tom gave the super secret signal, and we exploded. Tom took off like he does, and I desperately tried to hang on, pushing my power and HR through the roof to do so. Tom pulled off as I had carefully asked him to do (so I didn't die) and I got to lower the pace a bit. I looked back to see what had happened to the poor unsuspecting field, and to my dismay I saw two things. First, we had somehow gapped everyone. Matt and Brad had been stuck behind a few riders and weren't able to be right behind me when the effort started. Second, I saw Aaron Barr. Now Aaron isn't just some cat 5 dude. He's a cat 1 mountain biker that has decided to try his hand at road racing. He typically lines up with the likes of Chris Beck and Dave Weaver for a race. Think diesel engine, huge quads. When I looked back, I saw a gap, but that gap was closing VERY quickly. Barr was pulling what looked like the entire field back up to Tom and I. We pushed hard to keep things strung out, but after a minute, I looked back and all I could see were helmets. A bit disappointed and enjoying total hypoxia, I sat in behind someone and accepted the reality. That is, until I saw Matt and Brad fly to the front and from somewhere within the depths of the front 15 guys, someone cried "F***ing GO!!!" No rest for the weary. We slammed the pace again, which I've been told finally snapped the cord of the few hanging on. For the next 10 minutes, I was in one long state of agony. My heart rate was pinned at the max, and there was no recovery in sight. "So wait a minute Andrew, there were 15 guys in your break and you couldn't recover? What are you, some sort of amateur?!" After we had been away for 1 lap, we hit the final lap and the bell was rung. To put things into perspective, on the first lap we averaged about 23mph, the second 23.5 and both the third and fourth laps were 25mph. We had picked things up significantly after dropping off the kids. Tom and I started the last lap almost at the very back of the break. Matt and Brad were somewhere in the middle. As the lap went on, slowly but surely all of us made it to the top 6 or so positions readying ourselves for the flurry to come. Matt, made a move a ways from the line in an attempt to get away or string things about a bit. He accomplished both and was away until the final little hill into the finish line. I was sitting about 4th wheel or so when the group started to close around me. I checked left wanting to be close to the line when the road opened up, but there was no daylight to be had. Suddenly, I heard Brad who was right next to me and he saw me look, opened a spot for me and told me to get over now. I happily took the spot and now felt I had the perfect position. Thanks Brad for sacrificing that slot! We hit the final climb and I was in the second "row" of riders as we were now spread across the whole lane. Brad was behind me, Matt was right next to me and Tom was behind Brad. A BBC rider started his sprint from the bottom of the hill and looked pretty strong. But, in heeding the infinite wisdom of one Greg Garvin, I decided to not go too early and waited. The hill crests about 200m from the line, and I thought that sounded about right. I came around some dude and went after Mr. BBC in his pink jersey. The field exploded and sprints started all the way across the road. Meanwhile, Matt had spent a little too much on his jump to give his strongest sprint, but had ultimately set all of us up for a less cluttered sprint by stringing things out a bit. Tom was doing battle and recording battle with a gopro on his head, and Brad was a bit boxed in whilst sprinting in the middle of the pack. I was able to catch up to BBC just as he was fading and come around him with about 30m to go. It is a very interesting feeling to be the first man on the road in a bike race, especially when you can see the end, the finish line looms and beckons you come and take it. There is an incredibly narrowed focus that comes over you as time passes very slowly. You feel like you've the only one in the race, that its yours for the taking; but its not. There are very committed and dedicated riders bearing down on you wanting to take the victory just as much as you do. But you can't see them, so, you're in the eye of a hurricane. I kept pushing as hard as I could manage towards the line. When I crossed, I looked over and saw Aaron Barr directly next to me. He had been riding my wheel all the way through my sprint and had come around me at the very last second! Fortunately for me, it was 1 second too late, and I got him by a wheel length. Looking back, it was a very effective race. We planned a breakaway, and we got it. None of us had to deal with 45 dudes in a bunch sprint, just 15. We rode hard, aggressively, and had a ton of fun. Kudos to Matt, Brad and Tom for deciding that race, and not letting it be decided for you. I look forward to doing that again.